Pipelines trump your property rights. Energy companies are increasingly suing South Texas landowners as they work to build pipelines to accommodate surging oil and gas production. The question isn’t whether a company can route a pipeline across a property owner’s land. Pipeline companies, under Texas law, wield the power of eminent domain and can use it to acquire an easement even if the property owner opposes it. But landowners can negotiate for compensation and when those talks break down, companies can file suit. Actually, all the companies have to do is make and offer and if the landowner doesn’t accept, then they can file suit (really hardly a negotiation, more like a shakedown). In 2011, pipeline companies have filed at least 184 lawsuits against landowners in four South Texas counties, but concerns about pipelines snaking across your property whether you want them to or not should be of concern to more than South Texans. Folks in the DFW area have already expressed concern over the probability of increase pipelines in their region with the every expanding fracking industry. And many property owners along a proposed tar sands pipeline from Canada to Houston have already experienced heavy-handed treatment from the pipeline company, even though many of the needed permits are not yet in place. So while fracking or tar sands mining may not be happening in your backyard, it doesn’t mean that these activities won’t affect you directly. 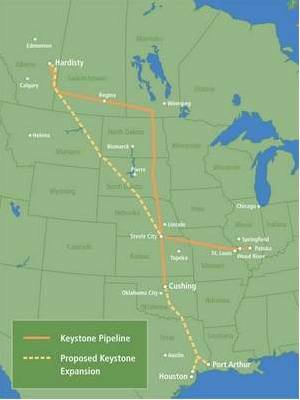 If you want to read more about the proposed tar sands pipeline and the proposed pipeline routes, click here. TransCanada has filed more than a dozen lawsuits to condemn land along the route of its Keystone XL oil pipeline in western South Dakota, trying to force the 47 percent of the landowners who hadn’t signed easement agreements along the states portion of the Keystone XL route, even though it hasn’t received the federal permit it needs to go ahead with the project. The lawsuits come at a time of growing opposition to the 1,660-mile pipeline, which would carry oil from tar sands fields in Alberta, Canada, and pass through several states, including South Dakota, on its way to terminals on the Gulf Coast. Environmentalists have joined landowners to lobby against the project all the way down the route, from Montana to Texas. Because the project would cross an international border, TransCanada also needs a presidential permit from the State Department. The decision, which hinges on the results of an amended environmental impact statement, will be forthcoming within weeks and Secretary of State Hillary Clinton is inclined to grant it. Landowners in Texas along the pipeline who haven’t been happy with their dealings with Keystone XL have already received letters threatening eminent domain action and Senators Craig Estes (R-Wichita Falls) and Robert Duncan (R-Lubbock) recently filed a bill (SB 18) that appears to be favorable to pipeline projects in their use of eminent domain and is moving through the legislature quickly. Citizens in the Barnett Shale region have already begun to express concerns about how this might affect their property rights. Those along the Keystone XL pipeline route, might want to keep an eye on this bill too.